The last time you went to the gym, how much weight did you lift? More than 100 pounds? 200? More than 75 tons, anyone? 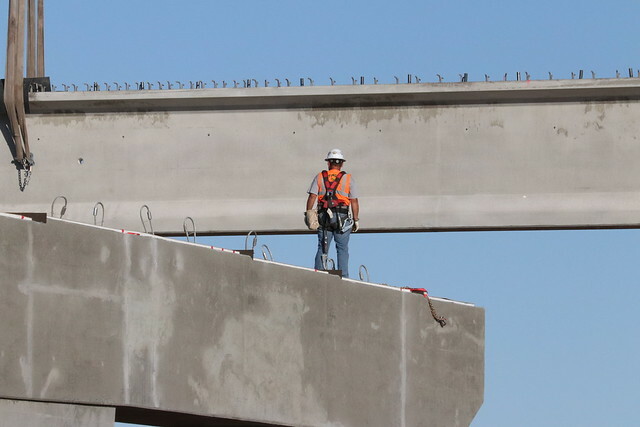 Those building a new bridge connecting Interstate 10 and State Route 87 in Eloy didn’t really lift 20 tons, of course. But 30 feet above the ground today, as two cranes lifted huge girders into place, these professionals, securely perched atop bridge piers, made sure these 145-foot girders landed in just the right spot. And they repeated the process over and over, as shown in the slideshow above. Precision may be difficult with a heavy girder, but it’s essential. There needs to be the right number of girders across each pier to support the bridge deck and traffic over decades. And each girder must allow room for the one that will connect to the next pier. Today marks six months since crews began clearing ground for new lanes of I-10 and the new interchange with SR 87. Placing girders on the bridge is another visible sign that work is continuing on schedule. The project is creating six new lanes of I-10 that will connect with the existing freeway just west and a few miles east of SR 87. Traffic will be moved to the new pavement as soon as this fall, with the entire project scheduled for completion by fall 2019. After this project and another in Casa Grande are complete, I-10 will be three lanes in each direction all the way between Casa Grande and the east side of Tucson.